One of the main principles to bear in mind when sailing a catamaran on a downwind course is that you should never sail directly away from the wind. 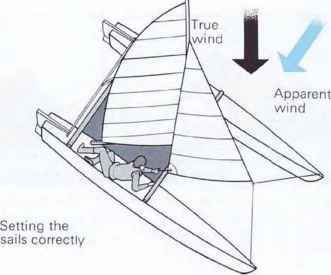 Instead, you have to sail a zigzag course, known as "tacking downwind" (see below). Because a catamaran achieves very high speeds on a broad reach-far higher than on a run-it is worthwhile sailing from one broad reach to another and jibing across. Although most monohulls also sail faster on a broad reach than on a run, it is not worth tacking a monohull downwind because the speed gained on the reach is not sufficient to compensate for the extra distance travelled. Provided you remember to keep the wind on the beam and adjust your course accordingly you will keep the boat sailing on the fastest course downwind. 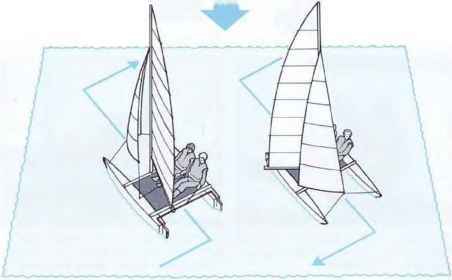 scale, it can be seen that there is a greater speed difference between a broad reach and a run (A-B) with the catamaran than with the one-design. The blue line in each diagram represents distance travelled from A on d fferent headings in a given time Although the diagrams are not necessarily to scale, it can be seen that there is a greater speed difference between a broad reach and a run (A-B) with the catamaran than with the one-design. Themethodfortackingdownwind is very similar to tacking upwind, right. When learning the technique it helps to tack upwind first and then follow your tracks back on a downwind course. You must perfect a smooth jibing technique where the boom is handed across the boat by the helmsman while the crew concentrates on resetting the jib to get maximum drive out of the sails. Remember that if you are too slow at the jibe you will lose the extra momentum gained from the zigzag course. Because the downwind tacking course exploits the point of sailing with the greatest difference between true and apparent wind, it is important to make sure that the sails are setting properly all the time. Tell-tales are an essential aid to interpreting the flow of air over the sails. When you start sailing downwind, build up boat speed on a beam reach, and then turn the boat onto a broad reach. Use the mainsheet traveller to position the sail and allow the mast to rotate enough to bring the luff of the sail well forward. 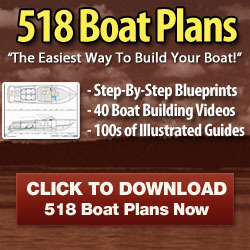 The crew should lie on the leeward hull and hold the jib sheet out and down (unless it is held by a device known as a barber-hauler which performs the same function). How to sail downwind in a caterman?